From Bilbao to Santiago de Compostela along the Saint James Way. Includes car, hotels and English guidebook. Discover the magic along northern Spain’s famous Pilgrim route and embrace the culture at beautiful, authentic hotels. Historical and cultural interests have emerged throughout the centuries, and are among the most interesting in the world. This region is not only about pilgrims, captivating churches and monasteries. The trip also meanders through some of Spain’s best vineyards and precious towns. Gastronomically, this is the most interesting part of Spain. For many, a month’s journey along the Pilgrim route to Santiago is an unattainable dream. Whether you do not have time, energy or capacity to walk the entire route, or else if you simply want to enjoy just a slice of it, a self-drive affords you the chance to soak in the lush scenery and the impressive cultural treasures along the way. 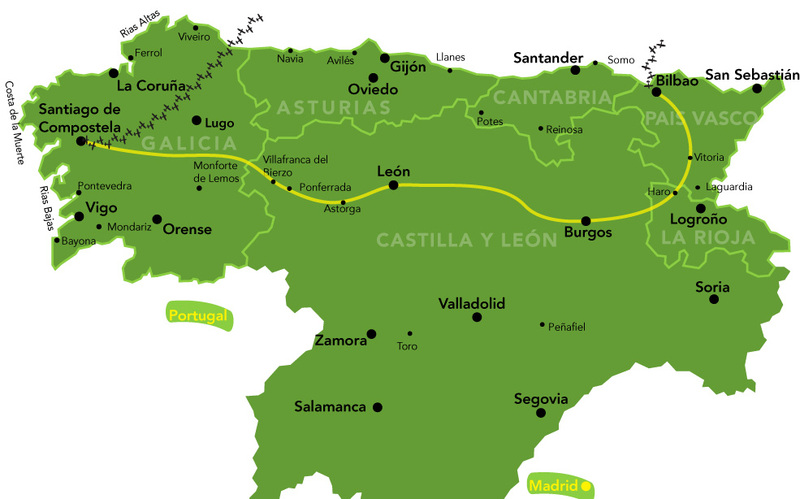 The route passes through some of the traditional parts of Spain you can imagine, and offers a wealth of sightseeing. We’ve chosen the best routes and can tell you how to reach and discover the finest on the Camino de Santiago. Follow the “Camino” at your own pace. The road from Bilbao will take you through some of the best vineyards in Rioja. West of La Rioja’s capital Logroño, you encounter the Pilgrim route the first time. The days in La Rioja can be used to discover fantastic wine villages, splendid old monasteries and superb gastronomy, characteristic of the entire route. In the historic city of Burgos, we will see a number of interesting sites. Its crown jewel is the cathedral and the old town surrounding it. Burgos is one of the most important stops on the Pilgrims Way and is a day for relaxing and enjoying a cozy atmosphere. This old Roman capital has been a central artery for the pilgrim’s journey for centuries. León offers a wide range of fantastic monuments such as a breathtaking cathedral. From León, you can discover a number of exciting excursions related to the Pilgrim route. If you need a break, as many pilgrims do when they arrive, León offers hundreds of tapas bars and cozy places where you can gaze upon pilgrims limping around with sore feet. From León, continue along the Pilgrims Way via small roads. Pass some of the most important Pilgrimage monuments and watch the landscape change dramatically from flat plains to mountains. Spend the night in one of the most precious villages on the Pilgrims Way to Santiago and discover a very special atmosphere influenced by pilgrims over the ages. The End Station for the pilgrimage route, “Camino de Santiago”, is packed with attractions and is one of the world’s most important cultural centers. Santiago de Compostela exudes charm and has a myriad of cozy streets, where there are plenty of opportunities to sample and try many local specialties. Its old town is hard to match. Surrounding the cathedral, you find the historic center, which is a UNESCO World Heritage Site. You will find its monuments are real pieces of art in different architectural styles. From Santiago there is a wide range of fabulous excursions such as the legendary “Costa de la Muerte” (Death Coast). The coast is a reef full of shipwrecks and legends, captured in its raw and natural beauty. Among the rocks are idyllic fishing villages and sunsets at “Finesterre” (World’s End), said to be among the most dazzling on earth.